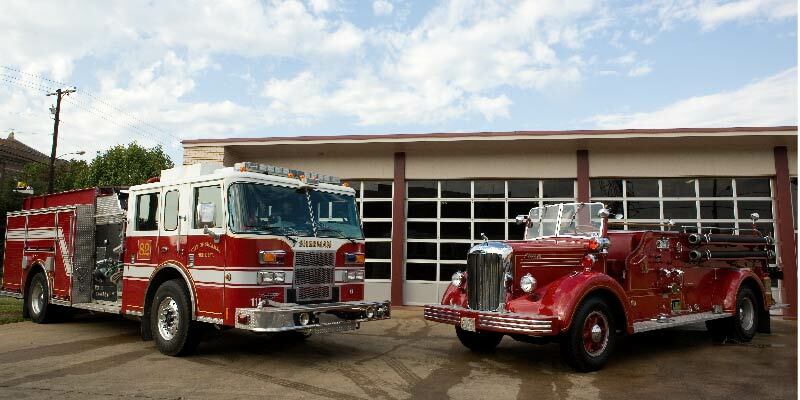 This classic American-made Mack fire engine was purchased by the Sherman FD in 1949 and has been fully restored. It is now used as a ceremonial vehicle in parades and special events. FYI: Fire trucks have ladders, fire engines pump water. (left-right) Cpt. Chad Martin, Chief J.J. Jones, Gerald Brown, Lt. Jerry Fuller (on the back left), Jeff Matlock, and (on back right) Dean Gardner. I promise courage—courage to face and conquer my fears. Courage to share and endure the ordeal of those who need me. I promise strength— strength of heart to bear whatever burdens might be placed upon me. Strength of body to deliver to safety all those placed within my care. I promise the wisdom to lead, the compassion to comfort, and the love to serve unselfishly whenever I am called. 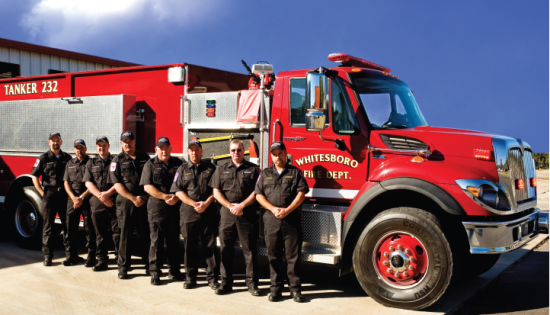 (1st row, left to right) Patrick Hilty, Kelley Copley; (2nd row) Bruce Geihausen, training officer; Robert Jones; (3rd row) Dennis Snider, Mike Flippo, Bill Ray, assistant chief and Clinton Little. 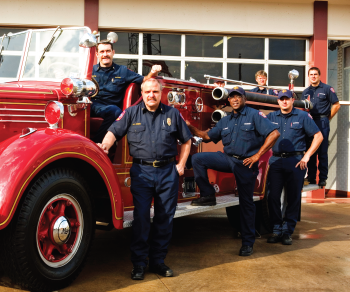 The badge of a fireman is the Maltese Cross. It is a symbol of protection and a badge of honor. Its story is centuries old. When a courageous band of crusaders known as the Knights of St. John fought the Saracens for possession of the Holy Land, they encountered a new weapon unknown to European warriors. It was a simple, but a horrible device of war. It brought excruciating pain and agonizing death upon the brave fighters for the cross. The Saracen’s weapon was fire. As the crusaders advanced on the walls of the city, they were struck by glass bombs containing naphtha. When they became saturated with the highly flammable liquid, the Saracens hurled a flaming torch into their midst. Hundreds of the knights were burned alive; others risked their lives to save their brothers-in-arms from dying painful, fiery deaths. Their heroic efforts were recognized by fellow crusaders with a cross similar to the one firemen wear today. The Knights of St. John lived on the island of Malta. 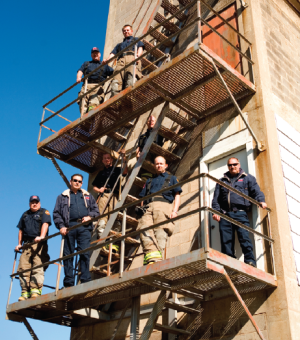 (left-right) Donnie Payette, firefighter/ ECA; Keary Williams, Engineer; Ethan Payatte, Firefighter; Joey Crawley, firefighter/ECA; Tony Carver, firefighter; Chief Kevin Walton, EMT; Brian Young, firefighter; Lt. Tim Welch, EMT. Nervous About Public Speaking? Join the Club. “Before, I never could remember the end of a joke,” said Mary Smith. “But now I can tell a joke and remember the whole thing.” Because Smith occasionally presents programs to large groups as part of her job with the Texoma Council of Governments, her supervisor urged her to join the Toastmasters to improve her public speaking skills.